Chateau Mongin is a school for the study of oenology in the Southern Rhone Valley. At Chateau Mongin, students learn the art of making wine. Roughly, up to 250 students are enrolled in the program at any time. The school offers a myriad of programs that range from 2 to seven years. They own their own vines in Chateauneuf du Pape. This allows students to not only learn how to make wine, but they learn everything about vine growing, vineyard management and harvesting as well. Chateau Mongin was founded in 1982. In 2012, Chateau Mongin was certified as being 100% Biodynamic. Chateau Mongin owns 2 hectares of vines in the Chateauneuf du Pape appellation. 1.7 hectares are used for the production of red wine. .3 hectares are reserved for growing white wine grapes. They produce 2 Chateaneuf du Pape wines, one red wine and a Chateauneuf du Pape Blanc. 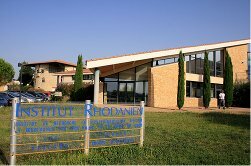 They also make wine from 18 hectares of vines the school owns in the Cotes du Rhone appellation. Chateau Mongin Rouge is made from 95% Grenache and 5% Syrah. The wines are aged for 12 months in used, French oak barrels. The production is on average 400 cases per year. Chateau Mongin Blanc is produced from a blend of 80% Clairette and 20% Grenache Blanc. The wines are aged in used French oak barrels for about 6 months. The production is close to 75 cases per vintage. Chateau Mongine can be enjoyed on the young side. Young vintages can be popped and poured, or decanted for about 1 hour. This allows the wine to soften and open its perfume. Older vintages might need very little decanting, just enough to remove the sediment. Chateau Mongin is usually better with 1-3 years of bottle age. Of course that can vary slightly, depending on the vintage. In the best vintages the wine should be consumed within 2-7 years after the vintage. Mongin is best served at 15.5 degrees Celsius, 60 degrees Fahrenheit. The cool, almost cellar temperature gives the wine more freshness and lift. Chateau Mongin is best served with all types of classic meat dishes, veal, pork, beef, lamb, duck, game, roast chicken, roasted, braised, stewed dishes, barbecue, grilled meats, sausage and cassoulet. Mongin is also good with Asian dishes, hearty fish courses like tuna, mushrooms, cheese, pasta, eggplant and tomatoes. The white wine of Chateau Mongin is best served with a myriad of different seafood dishes, shellfish, crab, lobster, sushi, sashimi, chicken, pork and veal, as well as Asian cuisine. Herbs, leaf and cherry notes, medium bodied, sweet and tart fruits and short red berry finish. Oak, along with dark, sweet ripe berries and round textures are in evidence, but the oak does not fade into the fruit. Oak dominates the nose in this early stage, the supple textures are a treat, but the oak carries through to the finish. Modern in style, some tasters will like this better than others. The wine is produced by students at a wine making school, so the quality varies from vintage to vintage, depending on the student and the year. Kirsch liqueur, fresh, sweet, round, fruits than end with a lively, red berry finish.